As long as you take your java black and without sweetener, you shouldn't worry about the caloric impact of coffee. 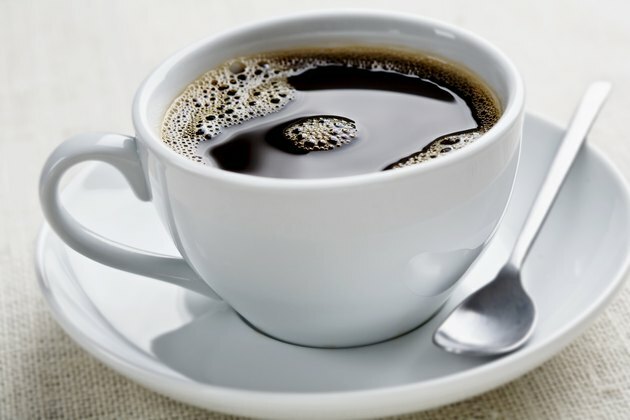 A cup of black coffee contains only a few calories and offers much more than caffeine and comforting flavor. The long-term effects and positive health benefits have been extensively studied. Cultivation of coffee probably began in Ethiopia, according to the National Coffee Association, but the earliest record of coffee growing comes from Yemen in A.D. 600. Moslem nations forbade export of coffee plants, but an entrepreneurial Arab smuggled viable beans to India in the 1600s. The Dutch smuggled the first living coffee plant to Europe in 1616 and started the first European-run coffee plantation in 1696 in colonial Java. Smuggling provided stock for major plantations in Latin America as well. French naval officer Gabriel Mathieu de Clieu raided the Royal Botanical Garden in Paris for a clipping from the king's tree. De Clieu nursed and defended the plant all the way to Martinique, where his plantation grew to 18 million trees by 1770. Brazilian agent Francisco de Melo Palheta obtained Brazil's first planting stock by romancing the wife of French Guiana's governor in 1727. Massive Brazilian plantations brought coffee within the reach of the average person by 1800. The USDA National Nutrient Database states that one cup of regular black coffee brewed from ground beans holds only 2 calories, and 1 fluid ounce of rich black espresso contains only 1 calorie. One teaspoon of regular instant coffee powder also carries just 2 calories. Brewing coffee from decaffeinated beans reduces the calorie count to zero, but decaffeinated coffee powder doubles the calories found in 1 teaspoon to 4. Sweeteners, flavorings and cream or milk deliver the calories in rich modern coffee drinks, some of which may yield 700 calories per serving. Coffee may have wrongly earned a reputation as an unhealthy vice, according to the Harvard School of Public Health. Early studies linked coffee drinking to heart disease and the development of cancer, but more extensive research did not uphold the first findings. By following initially healthy coffee drinkers for as long as 24 years, researchers determined that moderate coffee consumption of six or fewer cups daily does not affect mortality rates. For most people coffee creates no serious health risks. Current studies imply that coffee may prevent some diseases. Coffee may protect coffee drinkers from developing Type 2 diabetes. Coffee could also prevent cirrhosis or cancer of the liver, and lower the risk of cardiovascular illness. Since coffee contains many hundreds of active compounds, Harvard's School of Public Health suggests that actual effects on individuals vary. Harvard based its findings on an 8-ounce serving containing 100 mg of caffeine, but consumers choose the actual size and strength of the coffee they drink. One popular "grande" coffee doubles the volume and more than triples the caffeine of the type used in Harvard's study. Individuals with blood sugar problems or high blood pressure might find that coffee exaggerates those health issues. Though the role of coffee or caffeine in miscarriage isn't proven, pregnant women are advised to limit caffeine drinks to one cup a day. One component of coffee oils called cafestol does stimulate levels of LDL or unhealthy cholesterol in the blood. Paper coffee filters remove most cafestol and make coffee a safer choice for people with cholesterol concerns.